It is with regret that I say I couldn’t finish this book. I got within several dozen pages of the end, and even then I couldn’t make myself finish. This book has so much going for it: the world-building of a future South American enclosed society that’s extremely hierarchical and matriarchal and sci-fi is one of the best I have encountered in books marketed as YA, and as a result of this spectacular world-building, Johnson had a LOT she could work with in terms of exploring dystopian ideas and socially relevant themes of art and technology and race-based issues. Unfortunately, what THE SUMMER PRINCE lacked for me was an emotional connection with the characters. In between Johnson’s sinfully sensuous prose and her attempts to portray Enki as this beautiful and irrepressible, yet enigmatic, near-mythical being, it seems like there was lost the ways in which readers could concretely grasp the characters’ traits and motivations and desires. Enki read too much like a MPDG (except a guy) to me, and I don’t really have a problem with MPDG characters, except Enki’s character was much too slippery and bright for me to even grasp at the edges. Johnson is a talented writer, having already published several acclaimed works. 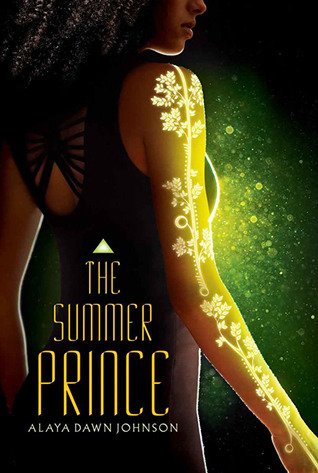 But perhaps THE SUMMER PRINCE would have been better marketed as not-YA, for in this genre in which so much depends upon readers’ connections with the characters, THE SUMMER PRINCE will have to face an uphill battle despite all that it has going for it. Cover discussion: One of the best covers of 2013, hands down. Evocative of the book's thematic content of art, technology, race, and the future without being lurid. So, so, so beautiful.